This week is a big one for comic book fans - the highly reviewed Logan is hitting theaters (I have my IMAX seats all reserved for Saturday night - can't wait!) and the new trailer for the most anticipated Marvel movie of 2017 just dropped: Guardians of the Galaxy Vol. 2. And yes, I know Thor: Ragnarok is coming too...but while the Thor installments have been *okay*, none have blown me away, and certainly not like GotG. Marvel Legends has their set of figures hitting stores right now, along with at least one other wave. This set includes Star-Lord, Drax, Yondu (all reviewed tonight), Nova, Angela, Darkhawk, and Major Victory (Vance Astro). Six of these (sans Star-Lord) have pieces to build the BAF of Titus. 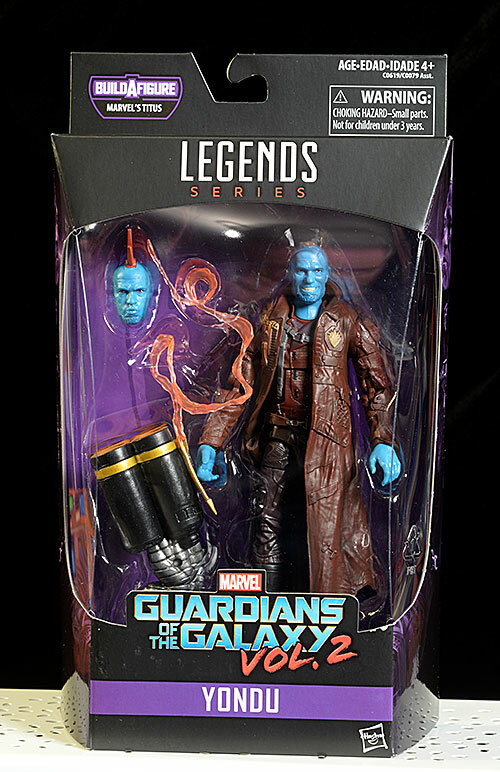 There's a second wave coming out later in the year, including other key movie characters like Rocket, Groot, Gamora, Nebula, and Mantis (along with a couple others), and you can pre-order the two pack with Star-Lord and the very cool Ego (Kurt Russel) already. These single figures will run you around $18 - $20 each, and they seem to be popping up at Target and Walgreens first. I really do like the collector friendly nature of these packages - you can open them up and keep the package, and return the figure and accessories later without damage. That's great for storage, for moving, for later sale, all kinds of reasons, assuming you have some way to store the package. It also promotes collectors opening these, always a big plus. I do wish they were a bit squarer though. That's really my only issue, and it gets back to the storage thing. With the slightly curved front, they end up taking more space and being harder to store than necessary. They also have some nice personalization with each character on the front and back, and include a diagram cataloging the whole wave and which BAF piece each figure includes. It's important to keep two things in perspective with this category - scale (these are 1/12), and price (around $20 each). 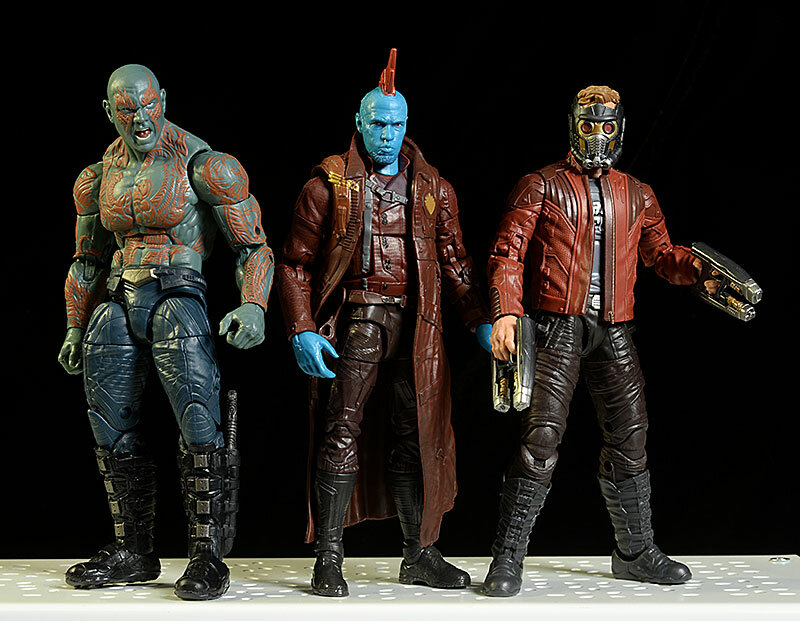 And at that size and price, all three head sculpts (actually five, since both Star-Lord and Yondu have a second head) are excellent. The work on both Star-Lord and Drax is an improvement over their release with the original GotG ML's, especially Star-Lord. 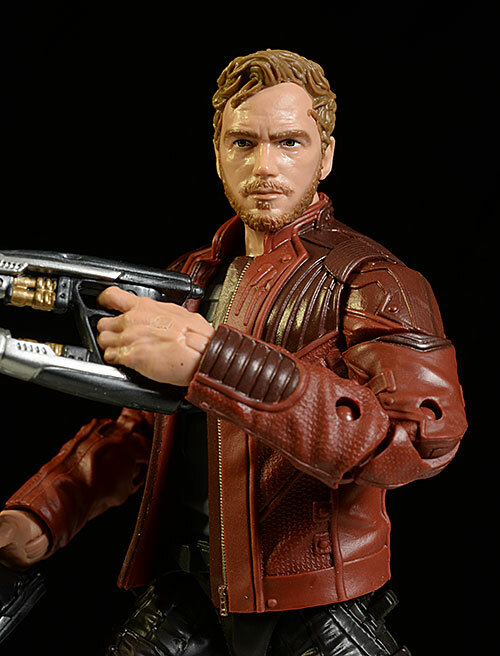 They eyebrows are still a little large, but the shape of the face, the lips, and the nose capture Pratt's character perfectly. There's also plenty of detail in his beard and hair, and while these aren't quite at the level of something like the One:12 Collective, they also cost less than a third as much. Star-Lord has a second masked head, based on the new costume design. Lots more detail here as well, and even this new, short jacket outfit has some amazing detail work in the tiny zipper, buttons, and textures. 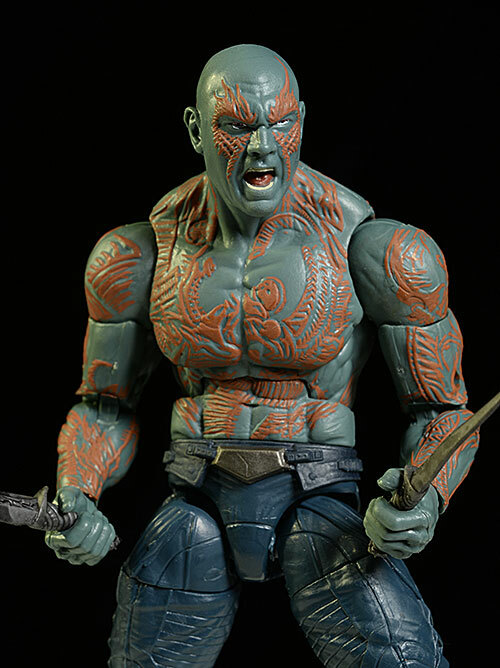 Drax has the sculpted tattoos of course, and the screaming head is really what differentiates him from the first release. The rest of the body - pants, boots - looks like a straight up re-use, but I like this portrait quite a bit. Like Star-Lord, Yondu has two portraits. One has his short hair, with a broad smile. It looks a lot like Rooker, but it's the second portrait, based on his tall mohawk look in the new movie, that really captures the actor's likeness. With this second head he's also whistling, an unusual expression for an action figure but one that fits right in with this character and his weapon. As I said, these are in the 6 - 6 1/2" range, with Star-Lord right about 6 3/8" tall. The plastic is high quality, but the hands are very hard - much harder than I expected. Getting the accessories in and out can be a trick, but I can only complain so much, since I spent a long time whining about the soft plastic they'd been using in the past for the limbs and joints. Clean, well defined details, even, consistent colors, and a reasonable number of operations set these figure apart from most of the mass market offerings on the peg right now. The clean work on all five portraits here is key to taking this line to the next level. Gone are the days of wild, googly eyes, sloppy edges between colors, and inconsistent finishes. 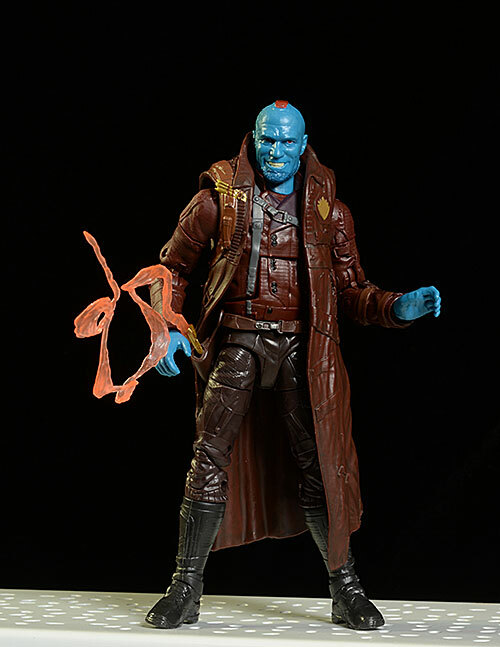 Yondu is the only figure here really restricted by his design. The long coat makes most of the leg articulation moot, and even some of the torso joints are less mobile than I'd like. Still, he's a sight better than most mass market figures, and well within reason considering the coat. Star-Lord is wearing the short coat, which means the waist, hinge hips, cut thighs, double pin knees, and rocker ankles all work great. I did find the arms less mobile than I expected, considering the rotating hinge shoulders, cut biceps, double pin elbows, and rotating hinge wrists. Still, you should have no trouble getting great action poses. All three have the usual 'ball joint above a pin joint' ML neck, but it's on Drax where it works the best. He gets the most tilt and lean action, and I had no trouble bending him at the ab-crunch and still getting a straight ahead position on the head. 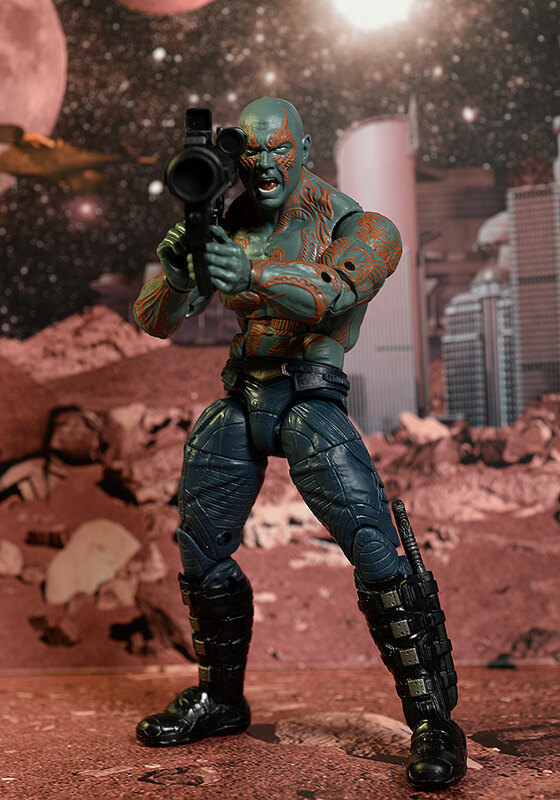 While Yondu and Drax include a BAF piece to build Titus, Star-Lord does not. He's the one figure that's unnecessary in the wave, all the more so since you can buy him with Ego in the two pack. He does have both his blasters though, as well as the second, masked portrait. Regular readers know how much I love getting that second portrait, and it always boosts the Accessories score. The blasters can attach to his hips thanks to to square posts on either leg. 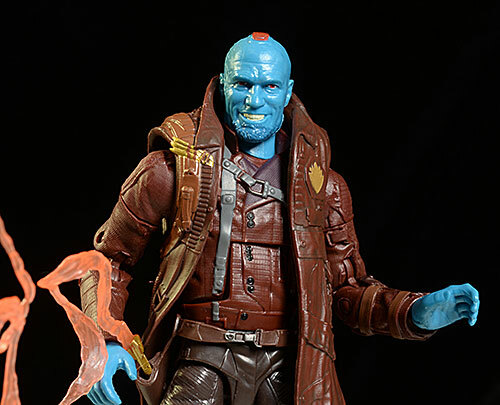 The same is true with Yondu, and getting one head sculpt that works with the first movie and one that works with the second movie might just spur collectors into buying two. He also has his Yaka Arrow, and the coat has been sculpted to lay behind the holster on his right hip. You can insert the arrow in the holster, and it has the 'smoking' tip, with a long, translucent ethereal beam trailing out. Which is the way I did it in the photo, or you can actually do it the right way, inserting the trailing beam into the holster as though the arrow has just launched - duh. This works best with the whistling head sculpt, and I would have liked a separate arrow without the effect, but it's a minor nit. 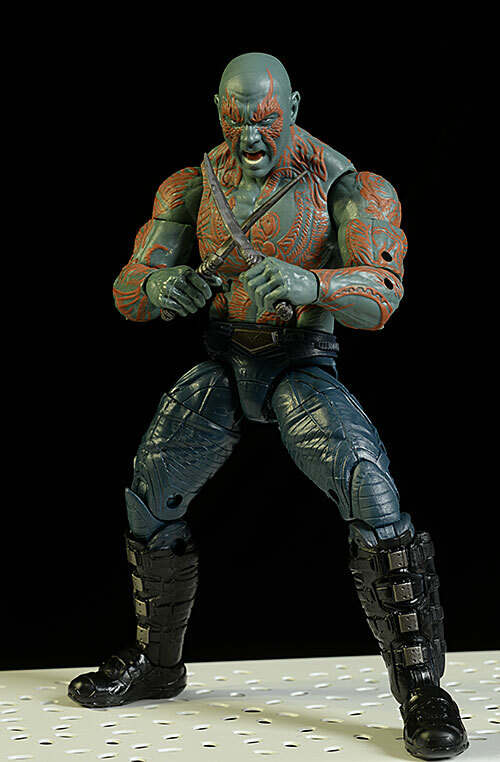 Drax also includes his two knives, which slip neatly in the scabbards on his calves. The sculpt appears the same, but they've improved the paint work with this release. He also has a huge missile launcher/cannon style gun with a pretty basic sculpt and an even more basic paint job. It is designed to rest on his shoulder, and I was able to get him to hold it pretty well. The last few waves of Marvel Legends pretty much define fun. Great articulation, great sculpts, great accessories, all for a decent price. With better quality plastic, they are also less likely to break or be damaged under normal use by collectors or kids. You can't argue with the value on these - while they price has remained constant, the quality has gone up. You're getting a much better 6" action figure for $20 under this label than you were (generally) two to three years ago. The hands can be tricky - they are made from a very hard, very stiff plastic. Getting the weapons into their hands can be tough, but a little heat will help. If you already have GotG ML's, do you really need these? Let's compare. You're getting a much improved head sculpt on both Drax and Star-Lord. The articulation and paint are similar, but that's just another way of saying 'great'. 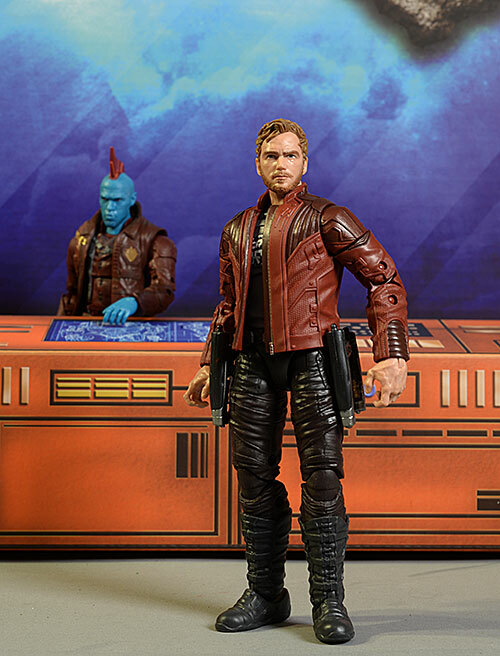 Star-Lord has fewer accessories, but Drax gets one more. So what's the final result? 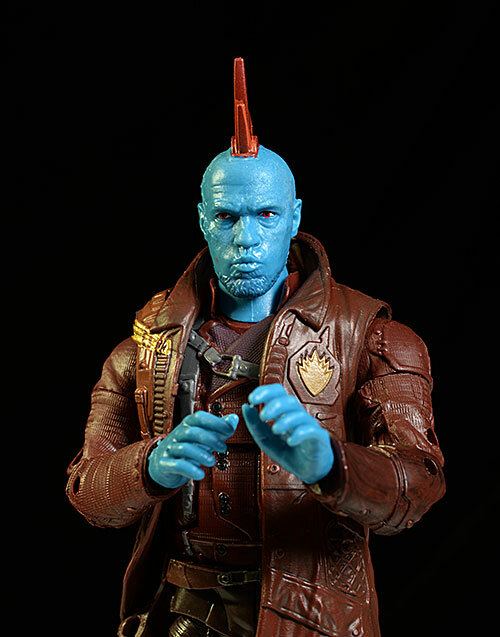 Obviously Yondu is a must have. With the two portraits, he can be posed with either the original figures or the new, which also makes a good case for buying two. Drax has the slightly different color scheme, new gun, and very cool new portrait. Whether that's enough to tip you over the edge or not is probably going to be heavily influenced by your desire for Titus and the required BAF piece. When it comes to Star-Lord, this version has all kinds of pluses over the original. Still, since he doesn't have a piece for Titus, buying him as part of the two pack with Ego might be the smarter move. - has the set of 7 for just $140, and they are in stock. - has the set of 7 in stock for $155. They also have the single figures for $18 - $25, depending on the character. - Entertainment Earth has a case of eight (two Star-Lords) for $160. They also have the Ego/Star-Lord two pack for $40. 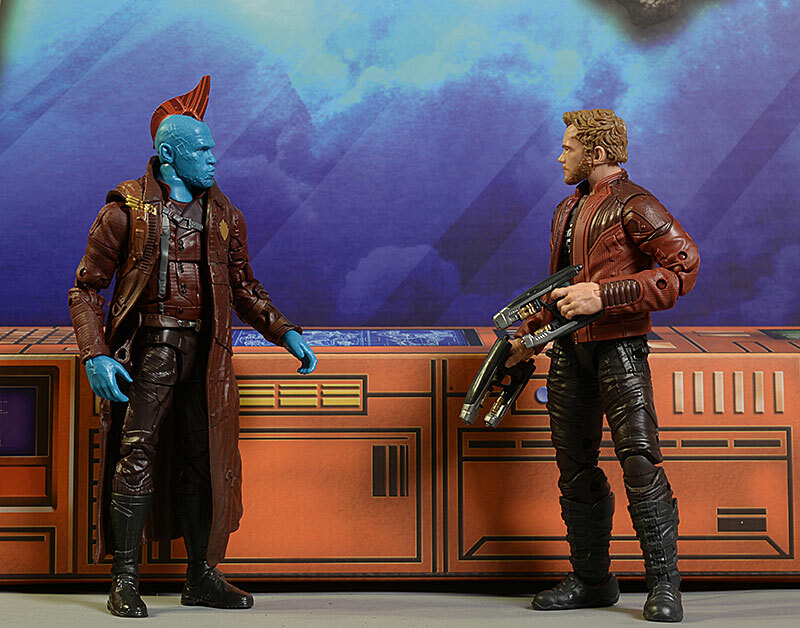 Of course you'll want to check out the original Marvel Legends released for the first Guardians of the Galaxy movie. I reviewed Star-Lord, Drax, and Rocket here, and followed up with a review of Gamora, Nova, and Iron-Man. The first BAF was Groot, included in this review. 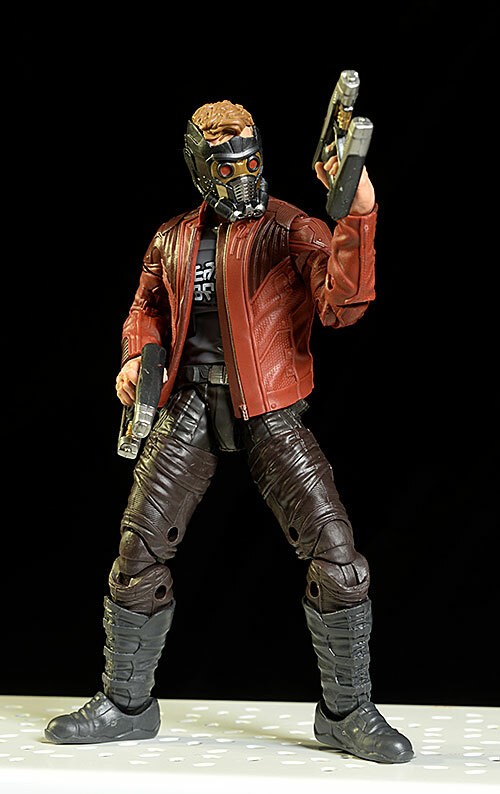 If you're looking for something a bit more high end, Hot Toys has produced sixth scale versions of Star-Lord, Gamora, Rocket, Groot, and Thanos. We're still waiting on Drax.